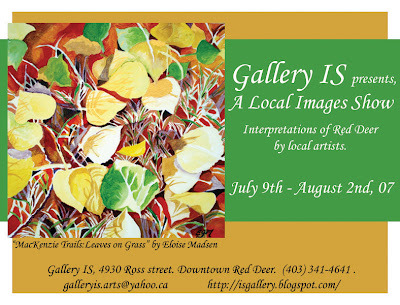 Please visit the Gallery IS from July 9th to August 2nd, to view our newest exhibit "A Local Images Show". This exhibit features new works from our represented artists, and selected works by community artists. This is a notice of changes to Gallery business hours. Saturday - Due to slow traffic in the mornings, the Gallery will now open @ 11:00am on saturdays. Westerner Parade - On July 18th the Gallery will open @ 12:00 noon. Be sure to come down to the downtown core and enjoy the parade celebrating the opening of Westerner Days. Visit www.downtownreddeer.com for more information. Gallery IS will be represented at Artwalk 2007. This event takes place in Heritage Square (across from the Farmers Market and Red Deer Curling Rink), Saturday June 16th. The festival runs from 9:00am to 5:00pm. This is a wonderful day of art, music, and demonstrations. Admission is free. Many of our artists will be offering unique artworks, that would not normally be sold in the gallery. This includes miniatures, unframed works, and older pieces. This is a great opportunity to find something special for yourself, or as a gift. Dear friends. We are very sorry for the delays in showing "Beauty and the Bug". Our exhibit space has fallen victim to a series of construction delays involved with the installation of a back door. As a result of this delay Gallery IS will be holding over Lauren's show until the 7th of July. Beauty and the Bug new Exhibit Dates: June 10th - July 7th. Official Opening Reception is STILL ON for June 10th 2-4pm. Everyone is welcome. Please join the Gallery and Lauren in celebrating her new work. The next group show, "Local Images" will now be presented from July 10th - Aug 2nd. The submission deadline has been extended to June 22nd.